Jimmy & Rosalynn Carter meet Cleoras’ children while at the South Bend Cubs game. 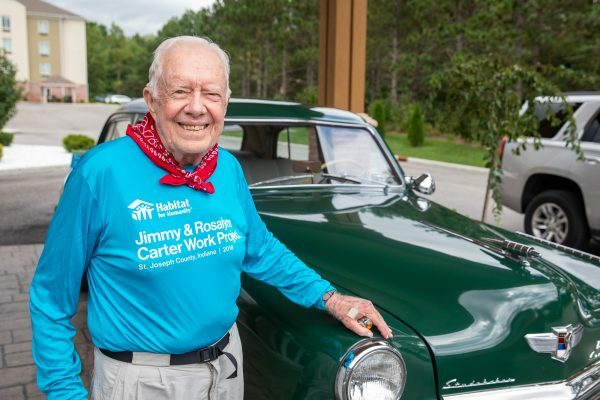 There was no slowing down at the build site on Wednesday morning as hundreds of volunteers arrived before the sun was up ready to take on the day. The morning started off with speakers E.J. Burke from KeyBank, Mary Mack from Wells Fargo, and Mayor of South Bend, Pete Buttigieg. 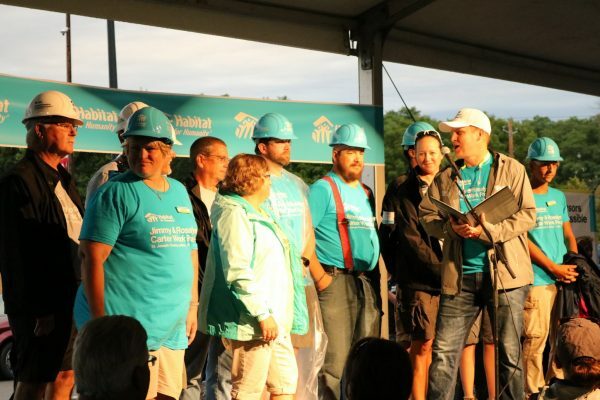 Each spoke on the importance of Habitat and why they support its mission. Future homeowner, Nusrat, gave a heartwarming devotional as a thank you to all volunteers. 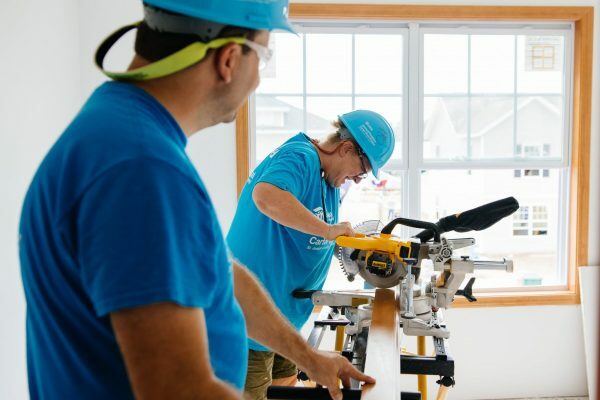 The two-story houses were in their final stages of completion, as volunteers worked on basement framing and base molding. 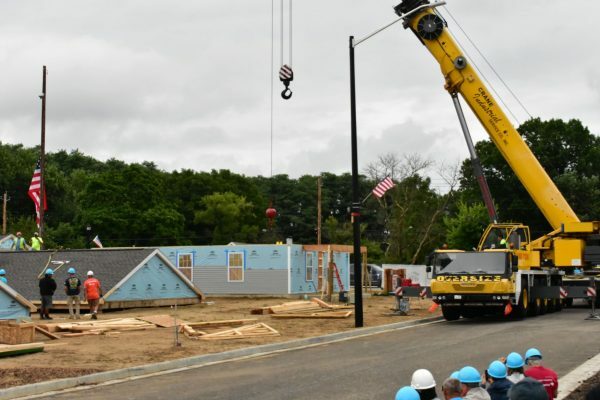 All single-story homes were being prepped for roof placement with the “Flying Roof” method. This method allows staff and volunteers to assemble the roof safely at ground level before it’s raised into place. Watch the video below to see roofs fly! In addition to the flying roofs, Wednesday was full of excitement and memories. The Construction Staff came to the stage as a special shout-out to the hard work they put in to prepare the site and to lead volunteers in building a brand-new neighborhood. 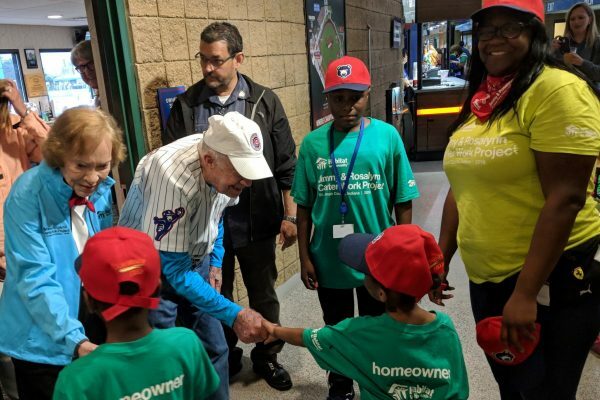 Habitat Night at the South Bend Cubs Game was made extra special by having Jimmy & Rosalynn Carter in attendance with the volunteers and future homeowners. The South Bend Cubs made it possible for 91 Habitat Homeowners and their families to attend the game at no cost. Many thanks to Andrew Berlin, Owner of the South Bend Cubs, and Joe Hart, President, of the South Bend Cubs, for their generosity to HFHSJC. 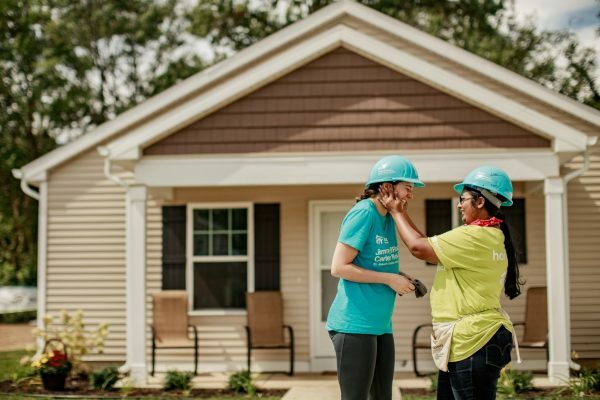 South Bend Tribune: Why did Habitat volunteers come to Mishawaka?